1. For the butternut purée, preheat the oven to 160°C, gas mark 3. Line a roasting tray with baking parchment. Cut the butternut squash in half lengthwise, remove and discard the seeds. Rub the inside of the squash with half of the butter and roast, flesh side down, for 1 hour or until soft. Allow to cool. 2. Heat the remaining butter in a pan over a medium-low heat. Add the shallots and gently fry for 8-10 minutes, until soft but not coloured. Scoop the flesh from the squash and transfer into a food processor with the cooked shallots and blend until very smooth. Season with salt to taste and stir in the cream. 3. For the maple caramelised butternut squash, increase the oven temperature to 200°C, gas mark 6. Line a baking tray with baking parchment. Peel the squash, remove and discard the seeds, then cut into 3cm cubes. Toss with the maple syrup, olive oil and salt. Scatter over the tray in a single layer with space in between. Roast for 25-30 minutes or until caramelised but still slightly firm. Remove from the oven and set aside. 4. For the lamb, increase the oven temperature to 220°C, gas mark 7. Rub the lamb racks with salt, pepper and olive oil. Heat a large frying pan over a medium-high heat. Sear the lamb racks, in batches, until golden brown all over. Transfer onto a roasting tray. 5. To make the herb crust, mix the herbs and honey, and spread over the lamb. Roast the meat for 8-10 minutes, for medium rare, or to taste. Rest for 10 minutes in a warm place, loosely covered in foil, before slicing into individual cutlets. 6. While the lamb is resting, return the maple caramelised butternut to the oven for an extra 6 minutes, or until caramelised and hot. 7. For the slaw, mix together the celeriac and apple with the mint. Meanwhile, combine all the buttermilk dressing ingredients and whisk until smooth. 8. 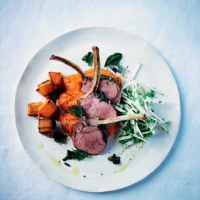 To serve, spoon some butternut purée into the centre of each plate and top with 3 lamb cutlets. Then to one side of the plate place a spoonful of the slaw, drizzled with a little dressing, and on the other side some of the maple caramelised squash. Finally, scatter over the shredded crispy fried sage leaves.